Singer Iggy Azalea performs on June 1, 2013 in London, England. In recent years, fascination with crowning a single as the track that defines this arbitrary chunk of time has only increased. August of last year saw the highest-ever interest in the “song of the summer” according to Google Trends. And since we’ll soon be in for a wave of stories about which song captured the essence of the hot part of 2014, it’s worth taking a step back to ask what, precisely, we mean by “song of the summer” and how we figure out what it is. Even five years ago, the answer would have been as easy as checking a single statistic from Billboard. But the steady shift in the way people listen to music — disrupted especially recently with the advent of label-sponsored, ad-supported online video and Internet radio — means the way we measure ears has changed substantially. Today, a number of public music-ranking charts track what people listen to on streaming services and terrestrial radio as well as what they buy — digitally or from brick-and-mortar retailers. And the most interesting part is that the charts don’t always agree. The top song on the radio right now is “Am I Wrong” by Nico & Vinz, according to both a three-day scrape of music on 19 major-market Top 40 stations2 as well as Nielsen data. 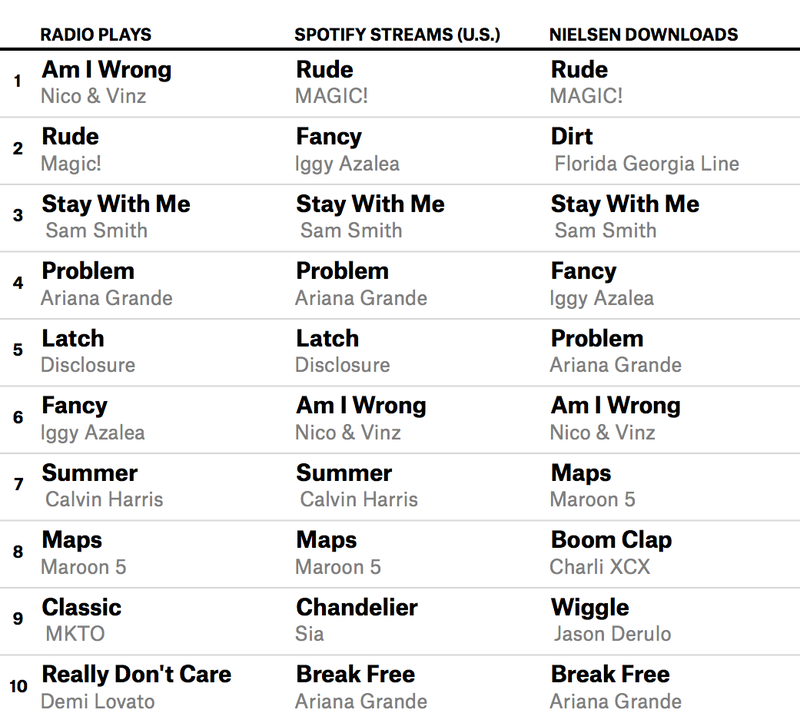 The top-streamed song on Spotify and most-downloaded song, according to Nielsen, is “Rude” by MAGIC!, while the most downloaded song in the iTunes store is “Bang Bang” by Jessie J, Ariana Grande and Nicki Minaj (though this could easily change by the time this article is published — a few days ago it was “Burnin’ It Down” by Jason Aldean). So what gives? Why are these data sources disagreeing on a pretty basic thing — the most popular song right now — and instead giving us such a wide range of answers? The reality is that people consume music differently depending on whether they choose to buy it, stream it or listen to the radio. “Radio tends to be the one that waits to get the most data before it plays what it plays,” said Gary Trust, Billboard’s associate director of charts/radio. Streaming services and digital sales can get a bit of a faster response to emerging trends, like when a superstar puts out a single and it sees immediate sales and streams, as we see right now with “Bang Bang.” The song is leading the iTunes chart, but it might not make an observable dent in radio for a few more days. “Radio is a lot slower — they have to make sure they’re getting their audience,” Trust said. But songs fly up and down the iTunes sales chart. “When a superstar artist puts out a single, it might be a big sales hit because people want to buy it right away,” Trust said. The Nielsen monitoring of sales, based on transactions both in brick-and-mortar music stores as well as online, is slightly more stable. Billboard factors in consistent radio data, instantaneous streaming data and impetuous sales data to help create its Song of the Summer ranking. What’s the key for an enduring hit there? Of course, none of this happens in a vacuum. All three media — streaming, downloads and radio spins — feed into one another. Clear Channel figures out what songs to put on its radio stations based on data from its streaming service, iHeartRadio. Tim Herbster, Clear Channel’s vice president of special programming projects, said the iHeartRadio chart incorporates data on song plays, users’ custom stations and “thumbs up” ratings. The company also incorporates video streaming, digital sales and data from Shazam, an ambient music identification app. But those streaming and digital sales are also influenced by what’s on the radio. “Radio is the main area where people discover music,” Trust said. In some cases, streaming might be a lagging indicator. Sam Smith’s “Stay With Me” is a hit across all platforms now, but according to Trust, it only recently started streaming on Spotify. “Part of that was the label’s decision to withhold it from streaming because they wanted people to buy it when the album came out,” he said. In addition to the classic charts — most streamed, downloaded and played on air — researchers are also looking toward new measurements designed to identify music as it rises in popularity. While radio play may be the main channel of music discovery now, these new charts seek ways to find hits that are getting big via word of mouth. Billboard just came out with its Billboard Trending 140, a real-time chart that looks at which songs see the biggest growth in the number of references on Twitter. Spotify, too, is interested in finding songs that may not be the most popular but are seeing social spread with its new Viral 50. “Weird Al” Yankovic, for instance, did really well on that chart the week his album “Mandatory Fun” dropped. Still, we’re not going to find the song of the summer based on what’s hot in the past hour. Herbster of Clear Channel said his pick for song of the summer is “Rude,” which he described as a “textbook mass-appeal summer hit.” Lamere of The Echo Nest is going with “Fancy,” and Trust of Billboard is going with “Fancy” unless “Rude” pulls off a sweep of the rest of the summer. Beyond the charts, what makes a song the song of the summer? 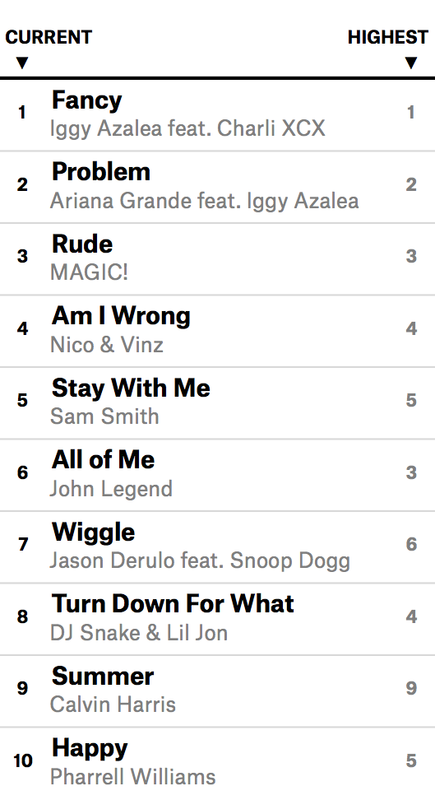 “Stay With Me” by Sam Smith has been an enduring hit across all platforms — maybe not No. 1, but always high up — and yet nobody’s trying to say it’s the song of the summer, mainly because it’s a down-tempo love song that’s unenergetic. “You’re more likely to have a song of the summer be uptempo and fun and danceable and kind of a party song,” Trust said. It also has to have cultural resonance. “One of the things we’ve done at The Echo Nest is to get a feel for the cultural context of music through web crawling,” Lamere said. He’s interested in a breakdown that looks at what songs people talk about when news sites write about the song of the summer, and comparing that to those songs’ plays. Lamere also noted a lack of nuance that comes with picking one song as the summer-defining track for the entire country. “You could probably have a Southern song of the summer and a Pacific Northwest song of the summer and they’d probably be different,” he said. The stuff they listen to in Manhattan, New York, is probably different from the stuff they listen to in Manhattan, Kansas. But really, why do people even care about anointing a song of the summer? And this year — thanks to a Canadian reggae fusion band — it may very well be a competition again. A track telling the timeless story of a father forbidding his daughter from marrying a member of a Canadian reggae fusion band. I reused the code from my classic rock radio article and conducted a scrape from July 19 to July 21 of the following stations: WZFT in Baltimore, WXKS in Boston, WWWQ in Atlanta, WNKS in Charlotte, WFLZ in Tampa, WKST in Pittsburgh, WKSC in Chicago, WKQI in Detroit, WIOQ in Philadelphia, WIHT in Washington, D.C., WHYI in Miami, WHTZ in New York, KXXM in San Antonio, KPPT in Denver, KKRZ in Portland, KIIS in Los Angeles, KHTS in San Diego, KDWD in Minneapolis, and KBKS in Seattle. In my humble opinion, this would be terrible because “Rude” is a terrible song.